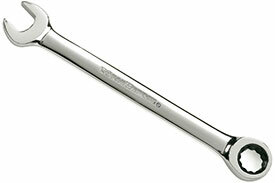 The GEARWRENCH 9050D 1 3/4'' 12 Point Combination Ratcheting Wrench is a ratcheting combination wrench. The ratcheting box end of the GEARWRENCH combination ratcheting wrench needs as little as 5° to move fasteners versus 30° for standard wrenches. These combination ratcheting wrenches allow the user to move a fastener with the speed and ease of a fine tooth ratchet. The GEARWRENCH combination ratcheting wrench features Surface Drive on the box end, which provides off-corner loading for better grip and reduced fastener rounding. The GEARWRENCH 9050D 1 3/4'' 12 Point Combination Ratcheting Wrench features a bright, full polish chrome finish and fully hardened forging for optimum performance. GEARWRENCH brand continues to expand its line-in ratcheting tools to help automotive and industrial technicians get their jobs done faster and easier.